A rather swift twist of tale happened at Naples yesterday as after reports flowing that Napoli are going to release their current coach, Walter Mazzarri, due to having a difference in opinion, the opposite thing arrive late in the night as the club announced that their coach will remain for next season. Reports from the Italian media suggested that Mazzarri and the Partenopei’s president, Aurelio De Laurentis, finally made peace with themselves and in the end find an agreement which led to the decision in keeping the coach for another season. “President De Laurentiis and coach Mazzarri completed a Championship, competition has always been considered a priority, had an explanation which strengthened them in their interpersonal relationships. 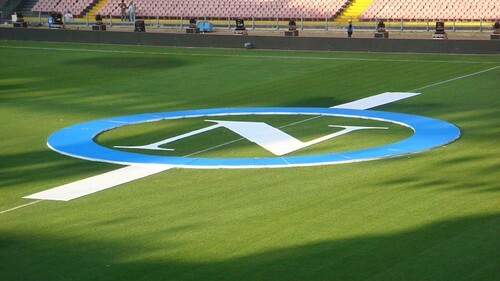 After two years of active cooperation, which led to Napoli in the Champions League earlier than planned, the President and the coach Mazzarri, laid the foundations of a new partnership to continue the program of construction and growth in the second five years, which will take those transformations in and be proud in football, always in respect of fair play built by Platini,” said a statement on Napoli’s official site. This reconciliation is surely something that the Napoli fans should be celebrating as there were several worries in the last few hours regarding Mazzarri’s future as reports strongly believed that Gian Piero Gasperini has actually been prepared to replace him. Fortunately, after holding another meeting together, the former Sampdoria coach and De Laurentis finally managed to step aside their differences and focusing on the club’s future. Previous reports suggested that Mazzarri is unwilling to commit his future with the Naples side because the coach has been receiving several interesting offers especially from Juventus, not only that it seems that the tactician and De Laurentis also had several disagreement about contracts and new signings. However, things seems to finally settles down now which would be essential for the club as starting from scratches next season with the Champions League football is right in the corner. Surely, De Laurentis doesn’t want the recent Sampdoria tragedy happens to Napoli next summer, especially because the producer has a special future plan for his club which seems to be heading into the right direction after this season’s success. Moreover, Mazzarri’s staying could also make several of their stars especially Marek Hamsik finally decided to stay with the club again this season because of the interest from several clubs.